This week on The Bugcast: as we ring in the new year, Dave and Caroline revisit their New Years Goals from 2017, make a half-baked attempts at Goals for 2018, and play 8 amazing tracks of Creative Commons and independent music from Liv Margaret, Lucille Furs, Seth Power, Yellow Feather, Scott Jacobs, melodysheep, Ro Tierney, and Degrees. 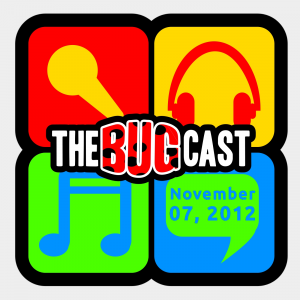 This week on The Bugcast: we talk mostly about podcasts and music, and play our usual mix of 8 great tracks of independent and Creative Commons music from Fasmate, Thoola, Jet Fish, Fall Walk Run, Wild Freedom, Symphony Of Science, Y P & Pork, and Syre & Fresko. This week: health update, school packed lunches, baby biting, and a very eclectic mix of music courtesy of Rumour Has It, Ted Brown, Reinhart Mulke, The Esoteric Gender, Junky Monkeys, Symphony Of Science, Dekadentes and Jediah. Welcome to NaPodPoMo Day 14! This one features the kids. Welcome to NaPodPoMo Day 7! Another late show today, but I have good reason. Well, not really. File sharing, capsizing and a triumph for freedom accompanies this week’s musical selection from Pete Vyler, 8in8, Jackal + Wolf, Symphony Of Science, La Dame Blanche, Barry Morgan, John Russell Band and The Dark Clan. We’re full of very bugs and viruses, but we drag ourselves out of our sickbeds to bring you 8 brilliant pieces of music from Beat Six, Icon Girl Pistols, Fresh Body Shop, The TenGooz, Symphony of Science, Atomu, This Public Life and Phrenia.